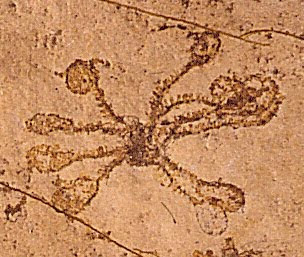 The Echinoblog: GIANT, floaty, swimmy fossil CRINOIDS! The Dinosaurs of the Fossil Echinoderm World! GIANT, floaty, swimmy fossil CRINOIDS! The Dinosaurs of the Fossil Echinoderm World! So, that you can see how different these critters are relative to the "normal" ones... some introductory crinoid background. ...and here's some basic anatomy and etc. 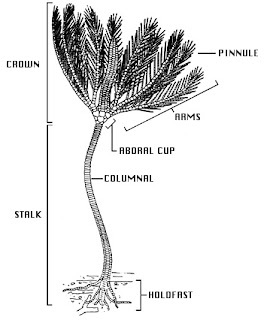 about the other body form of crinoids with a stalk. These "stalked" crinoids are the ancestral forms and are what you see in the fossil record. Most of them live on the sea bottom. Sometimes attached and sometimes with a long tail. Go HERE to an older blog I wrote, which has a little bit about their ecology. What I'm about to say may turn what you know...UPSIDE DOWN!!! It turns out FOSSIL crinoids from the Jurassic (about 145-200 Mya) and the Devonian (360-416 Mya) did something that NO modern crinoids are known to do!! They were PELAGIC. Much of the info for this section is from this paper by Seilacher & Hauff 2004. Basically, there were FOUR kinds of floating crinoids. Here is a handy guide from Seilacher & Hauff (Fig. 1) with the water current flow (added in blue) for emphasis. Crinoids are all filter feeders. So, those big cups with all of the arms on them?? They hold them into the water current and food as the water passes through them. The crinoids that float do essentially the same thing but sit in the middle or the top of the water column instead of the bottom. 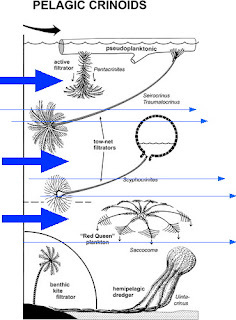 Here's the different kinds of floating aka pelagic crinoids. 1. "Floaty" crinoids that float on driftwood. 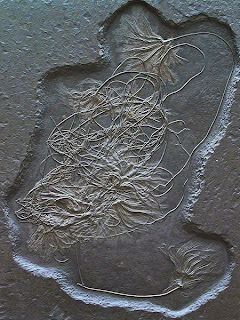 These are the best known planktonic crinoid and occur in the Jurassic (145-200 mya) rocks of Germany but have also been collected from China. They are often preserved attached to driftwood. The stalks were thought to be kind of elastic and used as sort of a filter-feeding "drag net" as they floated through the water.. 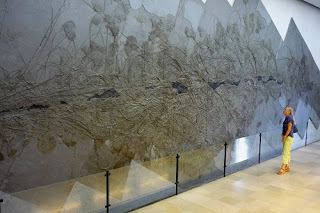 The fossil deposits of these animals are often excellently preserved. This includes several genera including Seirocrinus, Traumatocrinus, and Melocrinus and several of them are often found together in huge colonies. The other really obvious thing about these floating crinoids is that they are HUGE!! They are probably the LARGEST crinoids known!! IN FACT, they are probably the largest (or at least the longest) ECHINODERMS that the world has ever seen! See the slab above? There must be at least 50 individual animals (counting the filter feeding cups) on this floating log. How big are they?? The stalks on these crinoids can approach TWENTY METERS (60 FEET!). The filter feeding cups get to be easily a METER (about 3 feet) in diameter. Here's ME next to a single fossil of Seilocrinus in the museum for scale. Its not as big as some..but STILL....its LARGE. 2. Crinoids with BUOYANT floats! These are interpreted as actually having a FLOAT!!! They are positively BUOYANT. Similar to the ones above, these were thought to drag their feeding arms, sort of like a tow-net, filtering food from the water. These were called Scyphocrinites and they were from the Lower Devonian. The big "floats" of these animals are actually fossils called loboliths. They're filled with big porous, presumably air or gas filled calcium carbonate balls. Wow. 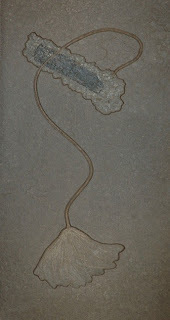 Genus name is Saccocoma and these fossils are found from the Upper Jurassic Solnhofen limestone in Germany. Its thought by some that these were free-swimming..possibly floating in the water column. 4. Floating Bottom "dredge" crinoids! This is one is just crazy (or at least the interpretation is!). This one is called Uintacrinus from the Upper Cretaceous and its thought that these had a gas or air-filled cup and that they DRAGGED their arms along the bottom. Functionally, this makes for one of the strangest terms I've ever heard.."Hemipelagic dredger". A swimming bottom, deposit feeder. The arms DRAG along the bottom like a frakkin' DREDGE net!!! Do ya' see that big mess behind my head?? That's because my mind is BLOWN! The arms of Uintacrinus, up to 1.25 m long, look too long and heavy compared to the 75mm calyx for Seilacher & Hauff's low-floating model. As far as I can see, those arms would have created a massive amount of drag on the substrate and pretty much anchored the crinoid in place. On the other hand, it looks like Seilacher & Hauff are saying that the Uintacrinus calyx was a lot lighter than I read Hess (1999) as claiming when I was looking up stuff on Uintacrinus a couple of weeks ago. I am interested in crinoid functional morphology and biomechanics, comatulid swimming, in particular, but I have also made some simple biomechanical models of Scyphocrinites, among other things. I'm a little dubious about using the word "float" when referring to crinoids, with some exceptions. 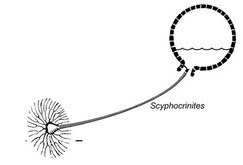 Scyphocrinites easily could have floated if the loboliths were filled with air. A far more academically interesting question is "how could a crinoid fill its lobolith with air?" Some options for a lobolith in life would have been to be filled with air, water, some buoyant fluid (e.g., an oil), or sediment. Only air makes the animal buoyant enough to float (I'll publish this one day, but considering that air is 1/1000 as dense as water, and 1/900 as dense as most biological oils, it's easy to see why air matters. Or you can simply jump in a pool with a small, inflated ball and realize just how buoyant that little bit of air is!). 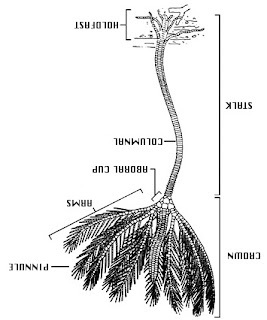 But again, how a crinoid gets that air is a mystery. 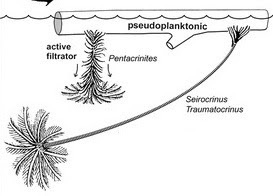 And that's before we even get into mechanisms of how a crinoid could do something tremendous like regulate its buoyancy. Like Chris, I am skeptical that Uintacrinus floated, especially in the model proposed. The amount of friction generated by those arms, like Chris points out, is tremendous - they would not have moved anywhere. 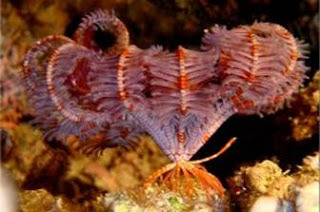 It's likely damaging to the arms of crinoids to be dragged around. And again there is the buoyancy regulation issue. First, they need some air space inside to make them buoyant. But once they produce that air, however they manage it, they don't have any obvious way to alter their buoyancy and get in the not too high, not too low position they are depicted in. For Saccocoma, if they were pelagic, they almost certainly were active swimmers, not floaters. The reason, again, comes down to buoyancy. 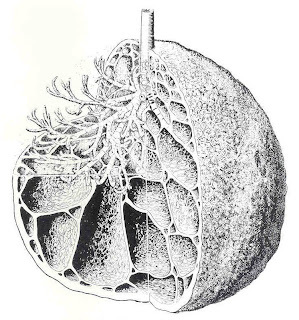 Absent some air-holding structure (none is apparent), they would sink because crinoid skeletal material is more dense than water (on the order of 1.2-1.5 g/cc, though this is highly variable). I have yet to see a crinoid or read a report of a crinoid that was less dense than water. Only Scyphocrinites, because of the lobolith, and if that lobolith is filled with air, is a strong candidate for floating. As for the putatively tree-floating examples, I lean toward buying them as well, but I think there is still room to be skeptical. And I wouldn't exactly use the word "float" to describe those crinoids. It was the wood that was floating, the crinoids were just hitching a ride... maybe. I think I would like to re-name myself Hemipelagic Dredger. That is the coolest name ever. over 50 individuals in the colony exhibited at the Urweltmuseum Hauff? Thank you very much for this info. You helped me very much for a research project in middle school! What diameter would the columns have been in the largest specimens (20-30 metres)? I regularly come across fragments when caving and it would be good to be able to estimate the original length of the specimen from the column diameter.